I originally wrote these words as part of my post about the Issa launch at House of Fraser but as I typed them, I got to thinking that they really warranted a post of their own. Plus as that last post was so picture heavy, I knew the story of a blogging friendship would get lost in the midst. 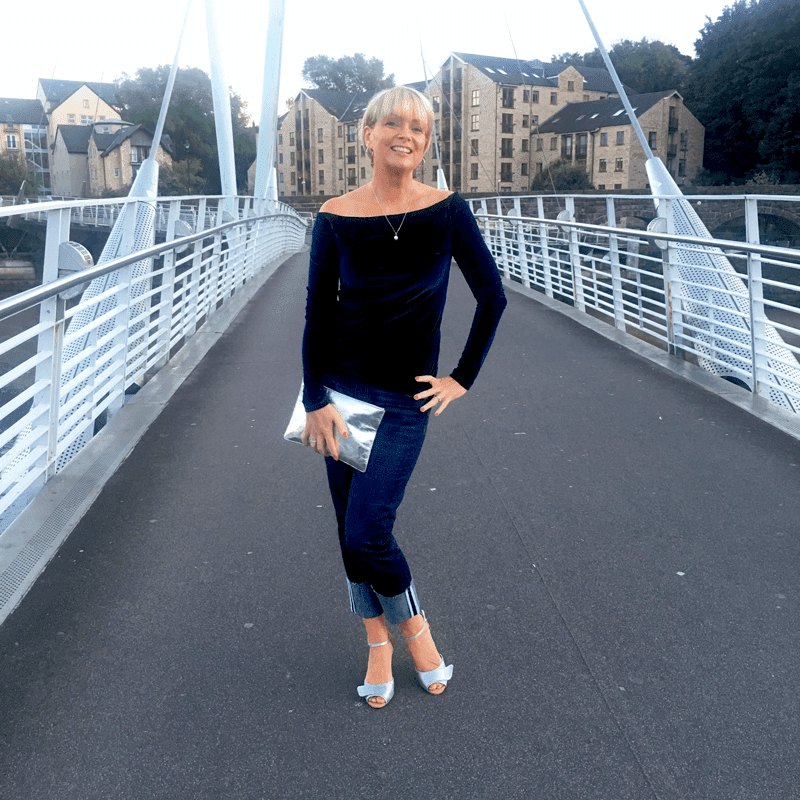 Nikki Garnett and I have been in regular contact since she set up her blog, Midlife Chic in 2014. I could tell from the first post that it was going to be a brilliant blog. She has such a beautifully pitched writing style which really sets her apart from other bloggers in this demographic. The reason for this is that as well as being a genuine and lovely person, Nikki knows her stuff. She's got a wide experience in marketing and publishing, including 9 years at Selfridges, where she was responsible for editing customer magazines. When I found this out about her, it immediately made sense because what comes across in Nikki's blogs is her knowledge of how fashion works. I learn something from every blog post. It's not just about sharing what's in the shops each seasons, Nikki tells you WHY that product is in the shops. The colour choices, the range selection, the thinking behind it - fascinating. This post is a good example. My sister in law has become a huge fan and I think she sums it up really well. Nikki's blog is not just about Nikki herself. It's not a 'what I wore' kind of blog with endless photos and poses in the same outfit. Yes, she shows you her outfits and how she works her wardrobe. 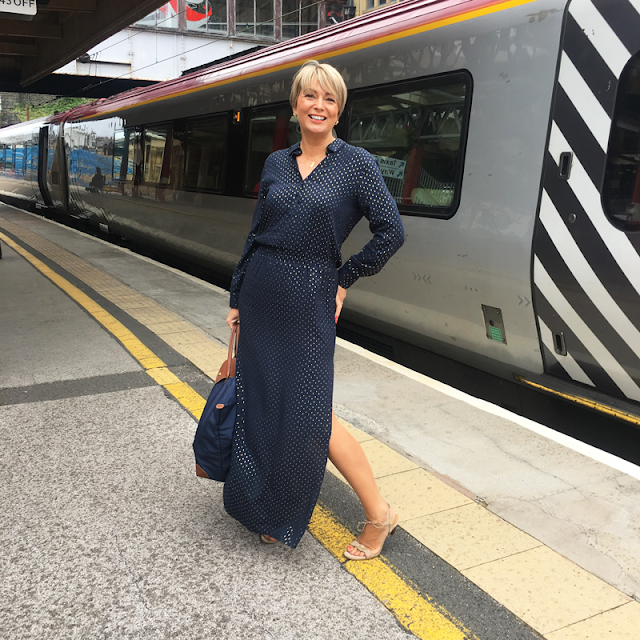 But she does it in a hugely informative way - usually mixing and matching with her existing wardrobe or showing you how a range will work for different occasions. We've been fortunate enough to meet at 3 different events in London over the past year alone, the most memorable of them being the Issa/House of Fraser event I referred to above. 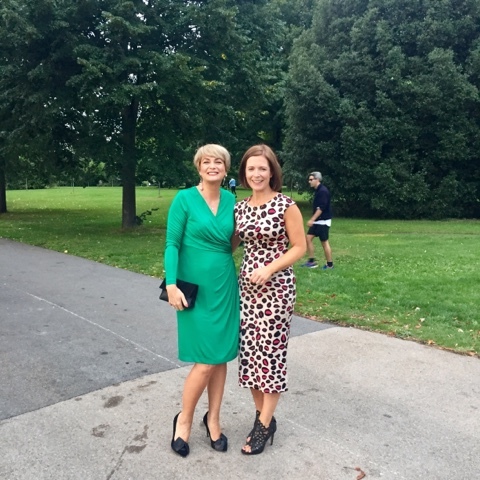 Nikki chose a gorgeous emerald green dress from the Issa range in a flattering wrap style and rather than our usual selfies, this time we actually got a lovely photo together thanks to the security men at Kensington Palace. Who I should say were highly amused at the two of us getting our blog photos on the avenue leading up to the palace. Nothing like a bit of banter to relax you for a photo. And a photobombing jogger. It was a wonderful night and after a number of occasions of meeting Nikki during the day, this was our first night out together and boy did we made the most of it, ending up in Nikki's hotel showing Japanese tourists how to do a tequila slammer and chatting to a man from Co Wicklow! Here's to blogging friendships. In a hugely competitive place, it's wonderful to find genuine ones. If you don't follow Nikki already, you'll find her blog on this link. She's also active on Facebook and Instagram - click on the words to link straight through. So Avril, there I was having a relaxing Saturday morning in bed catching up with my favourite blogs and this popped up. I feel so flattered and in fact quite overcome with emotion. You were so kind to me from the moment I took my very first baby steps into the blogging world. You sent me readers by the bucketful which you didn't have to do and it is testimony to your gentle and generous nature. 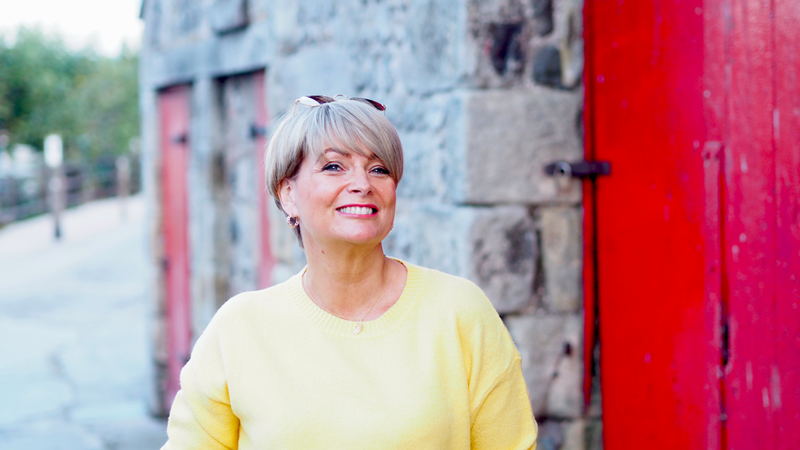 You have always been an inspiration to me and you still are now - lots of bloggers have told me to get on with Instastories but you gave me the advice and encouragement I needed to give it a go. I meet a lot of people but not very many that I gel with as instinctively as you. I look forward to getting to know you better and better over the years ahead and having lots more spontaneous evenings that involve wine, tequila slammers and bemused Japanese tourists. Thank you for being my best new friend and to anyone who is reading this, my dad used to say to me 'your best friends are the ones you haven't even met yet.' Hopefully Avril and I are proof that there are lots of new friendships and adventures ahead as we all reach this exciting new stage of midlife. Avril, I went over to Nikki's blog after I had read your post about the HOF event , I totally agree with everything you say, she comes across as a lovely person with a great sense of style, and you can tell immediately what she says is genuine, and I feel you can trust her to tell it as it is ! She has provided me with knowledge of how to put an outfit together to give it a little bit extra ! She has introduced me to Uniqlo ( hope I have spelt it right) and others that I wouldnt have known about. You are both very special ladies.